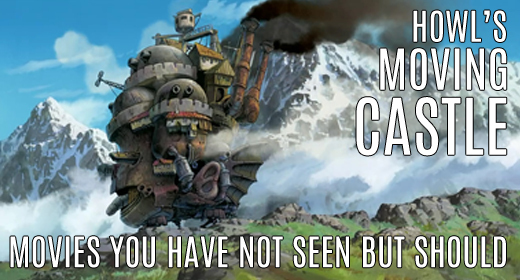 Miyazaki Month continues with this week’s classic Howl’s Moving Castle! Welcome back to another installment of “Movies You Have Not Have Seen But You Should”. Remember that throughout the month of September, we are celebrating the “Month of Miyazaki” in honor of acclaimed writer, animator, producer and director from Japan, Hayao Miyazaki. So throughout this month, we will look at four of Miyazaki’s films. For this week, we will look at the Miyazaki directed film: Howl’s Moving Castle. This animated film focuses on the character of Sophie (voiced in the English version by Emily Mortimer, who has also had roles in Cars 2, Hugo, Shutter Island, and the HBO TV series The Newsroom). She is a young, responsible girl who works as a hatter (one who makes hats). On the way to visit her sister, she runs into a mysterious wizard named Howl (voiced by Christian Bale, best known for his role as Bruce Wayne/Batman in The Dark Knight Trilogy). This encounter would change her life forever. Because of this encounter, she would later be visited by the Witch of the Waste (voiced by Lauren Bacall, known for such films as The Big Sleep, How to Marry a Millionaire & The Mirror Has Two Faces), who proceeded to place a curse on Sophie. The curse made Sophie an old woman (in this state is voiced by Jean Simmons, known for such roles as Guys and Dolls, Home Before Dark, and Spartacus) and unable to lift the curse on her own. Sophie then sets out to the Wastes in order to try and cope with the curse. She then is met by a living scarecrow who leads her to a castle that can move (hence the title of the film). While inside the castle, she meets Calcifer, (voiced by comedian Billy Crystal, no stranger to animated films as he’s the voice of Mike Wazowski in Monsters Inc. & Monsters University) a fire demon trapped in the castle. Calcifer agrees to help Sophie break her curse if she will help break his curse of being trapped inside the castle. Sophie then becomes a cleaning lady in the castle. While all of this is going on, there is a war going on and all the magicians are supposed to take part (including Howl). It is a war that threatens to take Howl’s humanity. Sophie is called upon not only to save Howl but in doing so could reverse the curse. You’ll have to watch to find out. The film initially premiered at the Venice Film Festival in September of 2004. It was then released in Japan in November of 2004. The English dubbing of the film (which was headed up by Pete Docter, best known as the director of Monsters Inc. and Up) was released in 2005. Along with the cast mentioned earlier, other English voice actors included Josh Hutcherson, Blythe Danner, Crispin Freeman and Jena Malone. The film went on to gross worldwide over $235 million dollars and was nominated for Best Animated Feature at the 78th Academy Awards (only the 2nd Studio Ghibli film to be nominated, the other being Spirited Away, which did win an Oscar). Howl’s Moving Castle is available on DVD and Blu-Ray. It is another great film from Miyazaki and Studio Ghibli. Definitely would recommend you pick up this film. It is another great Miyazaki film that you may not have seen, but you should. Happy Friday the 13th! What is your favorite slasher flick? It is a stunning film! Thanks for sharing! Jessica Brown Huff liked this on Facebook.